A man was tasered in the street after police allegedly saw him holding a sword, a court has heard. Barry Reeve, formerly of Shaw Hill Street, Chorley and now of Kingston Road, Leatherhead, was tasered and arrested after an incident on December 30 in Goring Street, Chorley, Preston Magistrates’ Court was told. 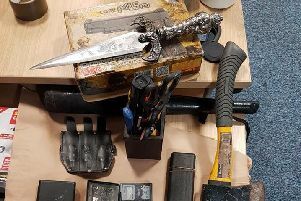 The 30-year-old old entered not guilty pleas to charges of possessing an offensive weapon in public and resisting a police officer during a brief hearing. The prosecutor showed the magistrates’ bench a picture of the item and said it was alleged Reeve had been walking down the street with the weapon, which is said to be around 3ft in length. He said: “ He was seen by police and told to put it down. The defendant denies the allegation and chose to have his case committed to Preston Crown Court. He will appear there for a management hearing on February 19 and was granted bail in the meantime.